VIFF 2018—Few pop artists have more interesting life stories than the actual music they produce. Britsh-Sri Lankan rapper M.I.A. 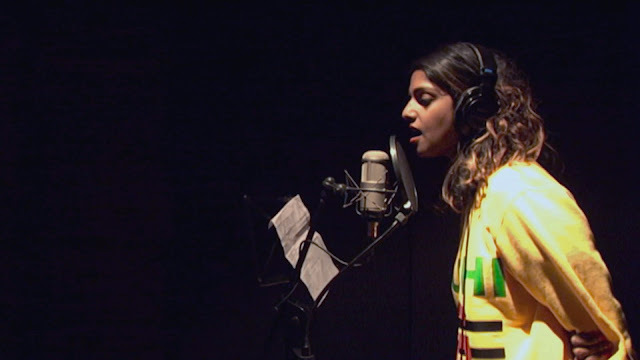 (aka Mathangi "Maya" Arulpragasam) shows herself to be such a complex, fascinating figure as her documentary Matangi/Maya/M.I.A., titled after her various monikers, reveals plenty of insight into her dynamic personal history in and outside of the spotlight. Directed by Maya's longtime friend Steve Loveridge, he somehow manages to compile years of self-shot home footage into a coherent documentary narrative chronicling her journey as a Sri Lankan refugee into a burgeoning global star. Originally, a young Maya aimed to be an activist documentarian in art school and filmed much of her young life. This depth of material shown in the film provides so much context for who the infamous rapper of controversy would eventually become. Half the film documents Maya as a young woman and art student well before her fame and notoriety as an even then thoughtful and uncompromising artist. Framed around her experiences as a refugee, immigrant, and political animal, Matangi/Maya/M.I.A. tells a complete story using almost entirely archival footage, pieced-together voiceovers, and other clever editing tricks. Her deep political roots as a Tamil woman and the daughter of the founder of the Tamil Tigers movement, Loveridge questions and incites who Maya is as she becomes an increasingly famous, successful, and powerful figure. She's full of conflict. The documentary feels like a traditional biopic while mostly avoiding clichés and tropes thanks to Maya's unique story and background. Even her talent and rising fame are really only explored through her activism and identity as a Tamil refugee. Littered with her early music and later trademark sounds, her music is used more as background or to contextualize her life's story. Maya's intimate documentary is a really fitting encapsulation and autobiographical account of her rich life and work. It contextualizes her identity and reputation through her own words without feeling too controlled. Matangi/Maya/M.I.A. proves itself an interesting watch for anyone who finds the artist at all fascinating. It's a truly fitting part of the canon of who Maya is as both a human being and artist. Matangi/Maya/M.I.A. screens at the 2018 Vancouver International Film Festival as part of the Music/Art/Design (MAD) stream.